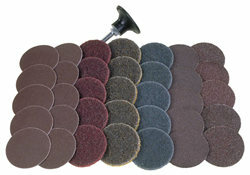 5 quick change discs each in A/O 36, 60, 80, and 120 grit. 5 surface conditioning discs each in coarse, medium and very fine. 1 medium density holder with 1/4" shank. All discs are Type "R"